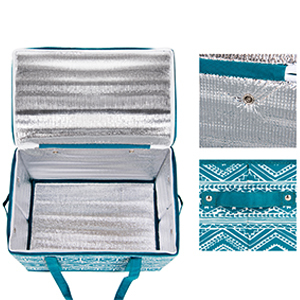 INSULATED LINING KEEPS FOOD WARM/COOL: Sewn with insulated lining, this Reusable Shopping Box featuring a zippered lid works great to keep your items cold/hot on the way home from store even in the middle of summer. And it the insulated inside is easy to clean with a damp cloth. BOX SHAPE STAYS WELL ON YOUR CAR TRUNK: With a stiff box shape measuring 14.5 x 10 x 10″ (Volume: 6.3 US Gallon), this Collapsible Box which stands on its own offers ample space for milk, bottles, produce and other groceries. And the flat bottom makes sure that nothing is rolling around in your car trunk. 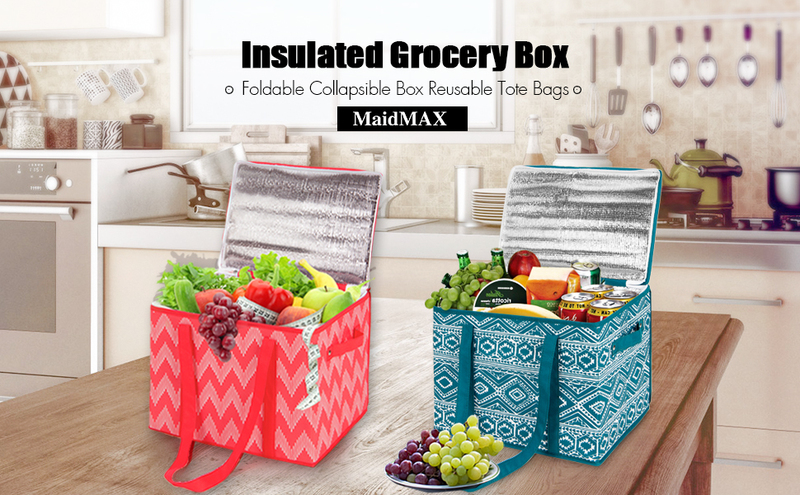 STURDY CONSTRUCTION FOR MULTI-USE: MaidMAX Insulated Grocery Box is solidly built with cardboard walls and a reinforced bottom. 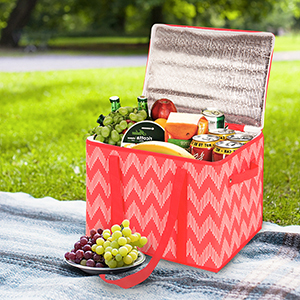 With a weight capacity of 30 lb, it’s perfect to serve as grocery, picnic, beach, potluck bags and more! 2 EXTRA SIDE HANDLES FOR EASY LIFTING: Sewn from the bottom and secured by metal rivets, straps of this Grocery Shopping Tote Bag are sturdy and long enough to allow for comfy carrying on the shoulder. And 2 side handles make it easy to lift the heavy loads. COLLAPSIBLE DESIGN FOR SPACE-SAVING STORAGE: Unlike those flimsy cloth bag that are a mess to store, these Heavy Dusty Shopping Tote Bags can collapse flat when they are not in use, so they can be easily store in the drawer, car seat back or trunk. Just take them to the store in your cart and open them when you’re ready to pack! Want to keep your groceries cold in a hot trunk on the way home from store? This insulated shopping box with reinforced structure can help! Just the right temperature! Insulated lining & the fully zippered lid help keep your items hot/cold for a couple of hours. Just the right size! With a volume of 6.3 US gallon, this shopping box bag is large enough to hold plenty of items while not too bulky to make carrying difficult and tiring. Just the right shape! Stiff box shape makes it to stays open and upright for easy loading. Rigid box helps to prevent things sliding around or falling out from the bag in your car trunk. Collapse flat in seconds! Simply fold them flat when you don’t use. Easily fit into a kitchen drawer or under a car seat for easy, convenient storage. Sturdy enough for multi-use. With cardboard walls on the sides and the bottom, from groceries, picnic lunches, beach essentials, cookware to laundry, there’s almost nothing that they can’t handle. Long straps and sturdy side handles make it less tiring to carry heavy loads.